Lightweight materials such as rice hulls can speed construction ten-fold. But good design is important! Note how Paul in Thailand (see yesterday’s blog post) added buttresses and steel pipe here and there as problems developed. Basically, he was just “winging it”. Who knows how long the house will last before having mold problems. That’s unfortunate because a similar house built correctly could last many decades. Imagine walls made of pairs of galvanized steel pipe set 15″ apart with rice hull tubing between. Set these pairs of pipe about 1m apart all along the perimeter of the house. Curved/round house shapes are best. Join the pipes together at top with pipe and elbows. 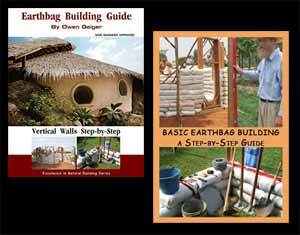 You can also build with wood posts and rice hull bags. Build the roof first before doing the hulls. Did you notice the pipe bond beam in the straw bale house article the other day? Have a shop bend the pipe in advance. Now you can work in the shade and not worry about the heat and rain. Use wide roof overhangs of at least 1m to keep the sun and rain off of the walls. Wrap around porches are best. Search our blog for Passive Cooling Strategies for two important articles that explain how you can beat the heat. No AC needed if you build correctly. Fill the tubing with hulls once you have 3 courses of gravel bags completed. After the rice hull tubing is finished, add plaster mesh and plaster. Our roundhouse roof recently leaked and now the earth plaster is damaged, so consider using more durable plaster in the tropics. Add a plastic moisture barrier under the floor. Miscellaneous details like doing the electrical are on our blog. Just search for keywords like “electrical” to see how the electrical wire can be run in the recesses between bags. Attach outlets in this case to the steel pipes to ensure rigidity. Please document your project and share with others. Seems like this would be a sound method to use with gravel fill as well. Definitely would be heavier than hulls but still faster and maybe a little lighter than moist soil. For whatever reason here in the us, if you look online for galvanized steel pipe, the prices are pretty high. However, if you look for EMT tubing, it is much cheaper and appears to be galvanized (zinc coated) as well. I also don’t see any reason for the more expensive large (1″ or more) diameter tubing, if it will be tied together between courses. Especially since I read that rebar should work as well. I might try this method with some not so sharp gravel and the raschel mesh roll I have, if you think it’s possible. If so, I’ll document everything and submit it to the take it to zero foundation. Did the leak occur in the original thatch roof or the metal sheet roof you replaced it with? The joints In the new micro concrete tiles are the main source. (It’s an octagonal roof. The ridges are tricky to seal.) And I think a lot of rain blew in through the roof vent. It would be helpful to see photos of what you described. Sorry, no drawings available at this time. It’s just earthbag tubing with galv. pipe on both sides of the wall. One suggestion for pipe foundations is PVC pipe filled with concrete.